This is in keeping with yesterday's encouragement to keep our eyes on Jesus and not on the world around us and it's troubles. When we focus on the difficulties and lack in our lives, it increases. When we focus on Jesus and our walk with Him, it increases. Mr. Andrews is simply restating the Bible principle of keeping our eyes on Jesus/God. 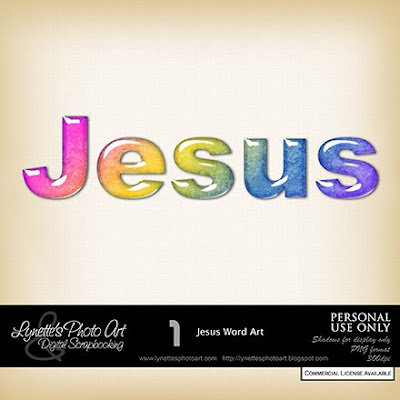 To help us remember this, today's gift is a gorgeous 5" "Jesus" word art. The detail is so beautiful! Enjoy! C from Paris: Yes it is stylized, and big hugs and thank yous to you and Deltalady6 for all the comments! Thank you to EVERYONE who writes!! Oh, and C, long ago you asked what my blinkie is - it's two gorgeous Macaws, you know, the huge parrots, with a butterfly flying across it and occasionally lighting up like a firefly. I made it with the Macaw paper I gave you quite a while back. That's gorgeous, thank you! And thank you for noticing me! I appreciate it, & all your wonderful freebies! Blessings! Thanks for sharing the "WORD"! After watching this little play i am blown away! They truly showed the love of God !! Glory to God and God bless those kids!!! Thank you for sharing your beautiful work this Word Art is gorgeous.